The Blue (or Indian) Peafowl has been kept and reared in captivity for over 2000 years. Peafowl are ground feeding birds with moderately strong legs. Three strong toes face forwards and one backwards. While they nest on the ground, they prefer to roost in the trees. Their wing surface to bodyweight ratio is not large and they are incapable of long flights, but are able to glide. 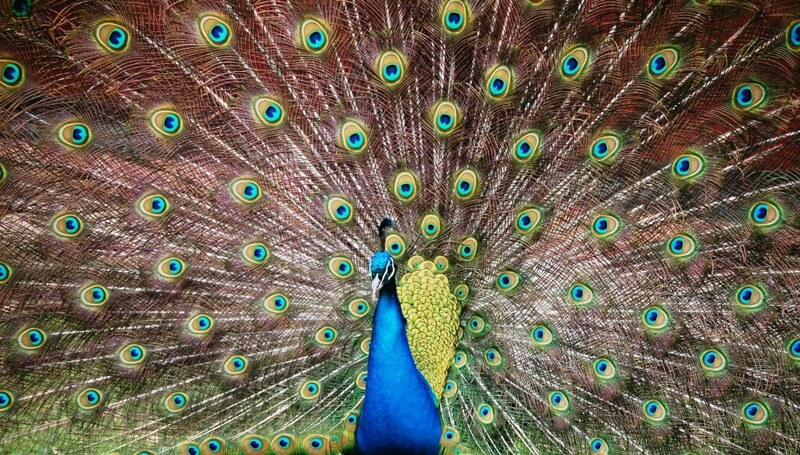 Peafowl are one of the most colourful of all birds. The tail feathers of a male can grow to be five feet long. Each of these long tail feathers also has a design near its tip that looks like an eye. The female does not have the long, showy tail feathers. Her feathers are also less colourful. Both males and females have a crest of short feathers on the top of their heads. Habitat: Peafowl are native to southern India and Ceylon. They mainly live in deciduous forests, cultivated lands and near villages. Many peafowl are also found around temples due to their sacred status to Hindus and Buddhists. Due to their popularity as free roaming pets there are peafowl living in the wild around the world including the UK. Population: Very common in most of their natural habitat. Lifespan: 20 – 24 years. Diet: Peafowl are omnivores eating both plants and animals. In the wild, they feed mostly on insects but will also eat snakes. Behaviour: In India peafowl are both popular and useful in that it feeds on young cobras. It utters an unpleasant wailing cry, especially before rainfall. Peafowl can be quarrelsome and often do not mix well with other domestic animals. Peafowl go to roost early in tall trees, calling and bugling loudly as they move upward.